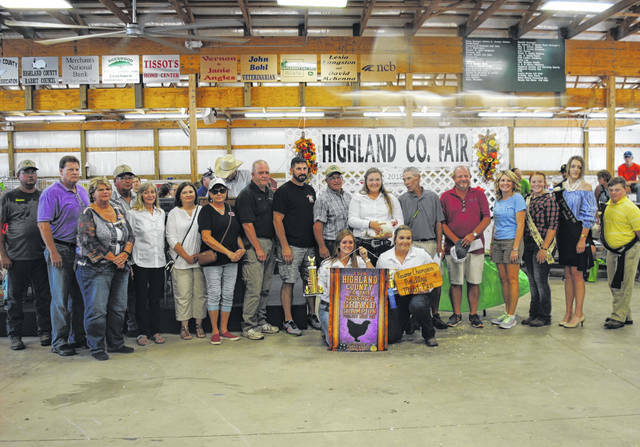 Gracie Lawson’s Reserve Grand Champion Poultry sold for $2,300 Thursday at the Highland County Fair. It was purchased by Baldwin Farms, Campbell Farms, Dean and Cindy Cox, Craycraft Farms, Jason Davis Family, Diversified Industrial Services, Mark Edenfield Fuel Division, Grant Edenfield Trucking, Family Farm & Home, Five Points Implement Co., Fordyce Farms & Southern Ohio Retro Foam, Highland County Commissioner Jeff Duncan, Merchants National Bank Hillsboro, NCB, Newman Insurance, Paris Lawncare, Plummer & Sons, Southern Hills Community Bank Lynchburg, Larry and Phyllis Strevel, W.A. Hodson Inc., Willey & Son, Wilmington Savings Bank and Zimmerman Brothers.